If you have ever wondered what on earth you are going to do with all of those photographs now sitting in forgotten albums, I can help! Creating a video clip is a bit like asking how much for a piece of string – anything worthwhile takes time and care. Each clip is as personal and original as you are. It does neither of us any justice to just ‘throw something together’, so if you are interested in bespoke, hand crafted clips created with love, care, and attention to detail, then you’ve come to the right place. My work is usually $60 per hour, however if you wanted something up and running quickly, please contact me on 0417 887316. I was in a hurry one day to find someone to film a presentation I was doing, I contacted about 5 different companies and found all of them difficult to approach. Then someone suggested Patty – how can I describe my relief? Patty immediately grasped what it was that I was trying to achieve, she knew how to put it all together and best of all understood all of my abstract ideas and was able to put them into the perfect show piece I was wanting! I love how Patty was able to connect so well with me and the people she interviewed for me after my presentation. Unbelievable value for money, incredibly easy to work with and creative genuis that she was able to convey simply and effectively. 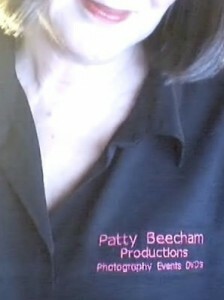 If you want your business to shine, you need Patty to help you with getting your message on video! After all it is the number one way to be found online! PS: look out for my new video when my new site goes live! Photography is my passion, and I have been creating memorable Video DVDs now for the past 12 years, using Pinnacle Studio software. Much more than a simple PowerPoint Slideshow, my DVDs are created using the latest sophisticated movie-making software, allowing for spectacular transitions and special effects. and the iconic Australian band Sirocco – to name just a few. Some of the DVD events include Corporate Golf Days, charity events, Grand Openings, School Formals, 18th, 21st, 50th birthdays or, (*gasp, older!) or perhaps celebrating a special wedding anniversary. Each image can be photographed without damage to the original pictures, to create a joyful, happy, thoughtful and memorable DVD, themed to music, for your family to enjoy for years to come. If I haven’t made you cry, then I haven’t done my job! You also have the added advantage of having all of your images now in digital format, on a separate CD! I can even upload your movie to the Internet, for distant family and friends to share. Funerals now feature DVD shows … and I have photographed many funerals and created DVDs as a lasting memory photographic memory of your Loved one. It’s a great privilege for me to be involved in your life’s journey. I look forward to creating your unique DVD to reflect the essence of that special person or event in your life. Download Funeral Photographer my brochure! With your own music – or mine – to choose from, combined with my love of computers and photography, each DVD movie is a true personal account of your life, and that’s gotta be good, right? My experience in marketing, promotions, newspapers and radio, help me to reflect a relevant, topical DVD for your family. It’s a great privilege for me to be involved in your life and history, and I look forward to helping you for your next celebration.